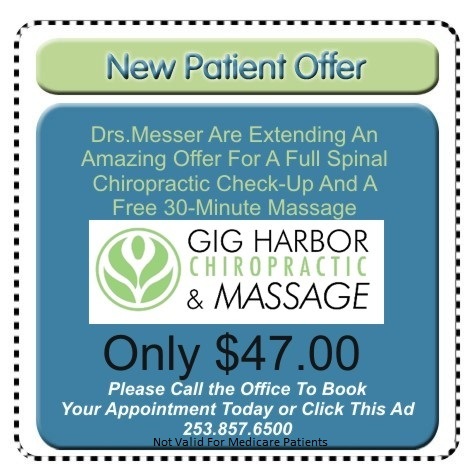 Located in Gig Harbor,WA, the leading health professionals at Gig Harbor Chiropractic and Massage are dedicated to helping you achieve your wellness objectives -- combining skill and expertise that spans the entire chiropractic wellness spectrum. Drs. Greg and Keri Messer are committed to bringing you better health and a better way of life by teaching and practicing the true principles of chiropractic wellness care. Our office is an all natural chiropractic health and wellness center. We do not perform any surgeries or prescribe any drugs or medication. We focus on and promote the body's ability to heal itself and use the most up to date technologies and techniques. "I was first introduced to chiropractic from a friend with scoliosis and by meeting Dr. Messer at the Tacoma Home & Garden Show..."